The evolution of branching was pivotal to the diversification of plant architecture, providing ways to colonize the environment and optimize resource acquisition both above and below ground. Fossil and phylogenetic evidence indicates that branching evolved independently in the two generations of the land plant life cycle. In this chapter, I focus on shoot systems and discuss two contrasting patterns, occurring at different levels: conservation and diversity. I show that two similar branching modes, terminal and lateral, are found across extant and extinct land plant lineages. Despite conservation of gross morphology, branching morphogenesis is highly disparate at the cellular level and is orchestrated in various manners between and within lineages. In contrast, the molecular mechanisms underpinning branch development could be largely shared among land plants. The evolution of branching accompanied the successful colonization of terrestrial ecosystems by plants. This innovation provided a capacity to occupy space in the three dimensions both above and below ground and contributed to the optimization of photosynthetic capacity and reproductive success. There are two alternating phases in the life cycle of land plants: the haploid gametophyte and the diploid sporophyte, gamete-bearing and spore-producing generations, respectively (See chapter “Alternation of Generations in Plants and Algae”). In bryophytes, extant representatives of the earliest land plants, the gametophytic body is dominant and has indeterminate branching growth, whereas the sporophytic body is highly reduced and limited to a single unbranched stem with determinate growth (Sussex and Kerk 2001). The divergence between bryophytes and early vascular plants, i.e., plants with lignified conducting tissues, was accompanied by a progressive reduction of the gametophyte and the evolution of indeterminate and branching shoots in the sporophyte. Phylogenetic and fossil data support bryophytes as sister to other land plants (Wickett et al. 2014), which suggests that branching in the sporophyte evolved from bryophyte-like unbranched ancestors and originated independently from branching in the gametophyte (Harrison 2016). While the genetic control of branching has been extensively reviewed, mostly from flowering plant studies (Domagalska and Leyser 2011; Kebrom et al. 2012; Schmitz and Theres 2005), few if any syntheses on the cellular basis of branch formation in land plants are available. This chapter focuses on the evolution of branching in the vegetative systems of major land plant groups and aims to highlight three major trends. The first is the repeated evolution of branching forms in both generations of the land plant life cycle, indicating that similar architectural strategies have arisen multiple times independently in evolution. The second is the diversity in cell division patterns underpinning branch formation, that is, the occurrence of diverse morphogenetic pathways within and between lineages to attain similar forms, suggesting that morphology is more constrained than underlying cellular processes. Although our knowledge of the genetic control of branching in bryophytes and early vascular plants is still limited, the third trend is the partial conservation of molecular regulatory pathways underpinning branch development between distantly related plant lineages. All extant land plant lineages are unified by the presence of an indeterminate vegetative body in the dominant generation of their life cycle (Fig. 1). The vegetative body is formed by a flattened leafless mat of photosynthetic tissue, has a bilateral symmetry in the gametophyte of hornworts and thalloid liverworts, and is typically characterized by leafy shoots with a radial or bilateral symmetry in the gametophyte of mosses and leafy liverworts, and in the sporophyte of vascular plants. Although plants have formed a diverse group with morphologies adapted to a wide range of environments since their emergence on land around 470 million years ago, they all develop through the activity of meristems localized at the growing tips of their vegetative bodies. Meristems comprise one to multiple stem cells that are responsible for producing all the other cells that will differentiate, i.e., acquire a fate, and form leaf, stem, or thallus tissues. Stem cells proliferate continuously, but the size of the meristem is kept relatively constant and its position remains fixed at the apex throughout development (Fig. 2a). Molecular signaling mechanisms underpinning meristem size maintenance are well characterized in flowering plant models like Arabidopsis thaliana (thale cress) or Oryza sativa (rice). Briefly, these mechanisms involve cytokinins, a class of stem cell-promoting phytohormones, and a negative feedback loop between a stem cell-promoting factor (WUSCHEL, WUS, Homeodomain transcription factor family), expressed in a central domain of the meristem flanking the stem cells, and a peptide (CLAVATA, CLV, secreted peptide ligand family) that is secreted by stem cells and restricts WUS activity (Stahl and Simon 2010). It has been proposed that cytokinins produced in the meristem epidermis diffuse into the deeper tissues and, together with WUS/CLV signalling, act as positional cues to scale and maintain the stem cell niche in the apical position. These data suggest that the apical-basal axis of the shoot is specified within the apical meristem. As cells exit the meristem, oriented patterns of division and highly anisotropic expansion are further needed to determine the growth direction of the stem and produce its axial shape. For instance, proper activity of the REPLUMLESS gene (RPL, Homeodomain transcription factor family) is required to orientate cell divisions in the rib zone of the shoot apex that produces inner stem tissues, and loss of function mutants in this gene show various developmental defects including reduced axial elongation. Although the structure of shoot apical meristems varies across land plants and may be unicellular (e.g., bryophytes) or multicellular (e.g., seed plants), anisotropic shoot growth driven by apical activity is a conserved property of plants. This fundamental characteristic underpins the axial nature of plant shoots, but also represents a structural constraint that restricts the range of theoretically possible architectures. An acquired capacity to branch, i.e., to establish new meristems and growth axes from preexisting shoots has therefore been essential to the diversification of plant shape (See chapter “Novelty and Innovation”). Branching mechanisms evolved repeatedly in both generations of the plant life cycle, and two major branching modes are usually recognized in land plants: terminal and lateral (Fig. 1). Terminal branching occurs by equal (isotomous) or unequal (anisotomous) splitting of the shoot apex into two new apices and is a reiterative process that gives to the plant a forked appearance. This branching mode, also called apical dichotomy or bifurcation, is a direct consequence of cellular rearrangements occurring at the shoot apex and usually involves a complete re-organization of meristematic tissues. In the strict sense, dichotomy refers to an equal or near equal division of an apical meristem, and in the case of single-celled meristems to the formation of two new apical cells by division of the stem cell (Bierhorst 1977). 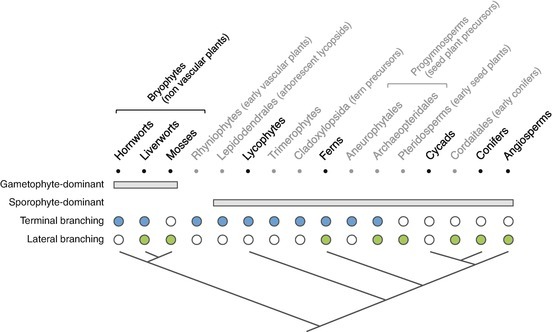 Terminal branching was the prevalent branching mode in many extinct plant lineages including rhyniophytes (early vascular plants), Lepidodendrales (arborescent lycopsids), trimerophytes, Cladoxylopsida (fern precursors), Aneurophytales and Archaeopteridales (progymnosperms). It is mainly found today in plants with meristems comprising one to a few stem cells, including hornworts, liverworts, lycophytes, and ferns and is rare in plants with multicellular meristems such as gymnosperms and angiosperms. In terminal branching, branch meristem initiation and outgrowth are not distinct processes, which means that branch development proceeds directly following the specification of a new branch meristem without a growth arrest. Some dichotomously branching plants are leafless, like thalloid liverworts or hornworts, and others including lycophytes and ferns have leaves. In these plants, the position and timing of meristem bifurcation is independent of leaf initiation patterns, which suggests that branch and leaf development are controlled by distinct mechanisms. Lateral branching differs from terminal branching in various aspects. Most importantly, branches develop in lateral positions with regard to the main shoot, in association with leaves and without disrupting the cellular architecture of the shoot apical meristem. Two phases are typically distinguished during lateral branching: lateral meristem initiation and outgrowth. Lateral shoot meristems usually initiate in the main shoot apex during leaf initiation and in association with the leaf meristem. Lateral meristems may develop immediately into branches, in which case initiation and outgrowth is a single continuous process, or form a few leaves and enter a period of dormancy. The inhibition of branch development is controlled at a distance by the main shoot apex, a mechanism called apical dominance (see Section “Are Regulatory Mechanisms of Branching Shared Between Land Plants?”). Growth arrest may last a few days to several years and may never cease. Release from dormancy is triggered in response to internal or environmental cues, such as phytohormones, light or temperature, or following the loss or termination of the main shoot apex. Lateral shoot meristems may also form de novo at some distance from the apex from differentiated tissues. Lateral meristems generally develop in leaf axils (axillary branching), but they may also form in relation to a leaf but at a distance from the axil (extra-axillary branching), or directly on a leaf (epiphyllous branching). Lateral branching is the prevalent branching mode in mosses and seed plants and is common in leafy liverworts and ferns. While branching types are generally conserved at a gross morphological level across land plants, the cellular basis of both terminal and lateral branching is highly disparate between and within lineages. Histological and clonal analyses of bifurcating apices have been performed to investigate how terminal branching is controlled at a cellular level. They have revealed distinct cellular mechanisms, distinguished by the number of apical cells comprising the meristem, and whether these cells disappear and are replaced by newly formed branch meristem cells during the branching process or remain functional and become incorporated into branch meristems (Gola 2014). Hornworts comprise c. 250 species and might represent the most basal lineage of land plants. Although they are key to understanding the origins of plant evolution (Wickett et al. 2014), they are among the least studied plant groups. In hornworts, the gametophyte is dominant and consists of a photosynthetic thallus growing by the activity of single apical cells located in peripheral notches. The structure and function of the apical meristem is still debated. Bifurcation has been proposed to take place by a series of divisions of the apical cell to form a row of meristematic cells, in which two daughter cells acquire an apical cell function and promote the development of new growth axes (Schuster 1984). Studies in different hornwort species have evidenced the presence of multiple identical cells lying side-by-side in meristematic notches (Fig. 3a), but the main apical cell has not yet been identified. Such cellular configuration might be transient and could correspond to an intermediate state of the branching process or to the state of the apical meristem during normal vegetative growth. Liverworts comprise about 7500 species, and their phylogenetic position with regards to other bryophytes has not been fully resolved. Most phylogenetic studies place liverworts as sister to all other land plants, but recent phylotranscriptomic analyses recovered a clade comprising liverworts and mosses as sister to vascular plants, with the hornworts sister to all other land plants (Fig. 1) (Wickett et al. 2014). Besides their evolutionary relationships, liverworts are classified into three groups based on their overall gametophytic morphology: leafy liverworts, and simple and complex thalloid liverworts. Terminal dichotomous branching is predominant in the gametophyte of complex thalloid liverworts, such as the well-studied species Marchantia polymorpha. Thalloid liverworts are characterized by a vegetative body lacking lateral foliar appendages and growing horizontally from apical notches in which one to several meristematic cells are embedded, similarly to hornworts. Histological analyses of cell division patterns in Marchantia emarginata have suggested that the notch meristem comprises two initial cells (Fig. 3b). During bifurcation, the number of initials expands up to eight and this group of cells divides into two branch meristems, each one comprising a pair of initials (Burgeff 1943). A new bifurcation occurs every five divisions of the initials, suggesting that this process is endogenously controlled. Alternative cell division patterns have been described in other liverwort species. For instance, observations in Metzgeria furcata suggested that the meristem comprises a single apical cell and that branching involves the formation of a new initial cell next to the apical cell rather than its direct division (Goebel 1905). Lycophytes form the oldest extant group of vascular plants and are distributed between three orders, the Lycopodiales (c. 388 species), Isoëtales (c. 250 species), and Selaginellales (c. 700 species). Descriptions of the cellular organization at the surface of fixed and cleared shoot apices have been used to infer meristem structure in the sporophyte of the firmoss Huperzia lucidula. 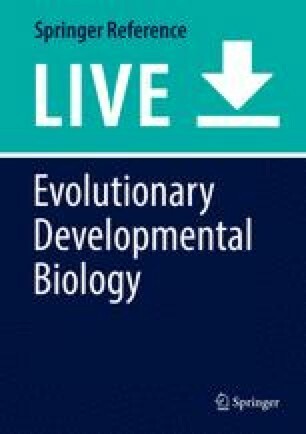 These studies suggested that shoot growth is driven by four initial cells, and these cells may have a transient character and be replaced during development (Gola 2014). Dichotomy could occur through the division of an initial cell and the subsequent displacement of one of the two resulting sister cells away from its original position to form two independent meristematic centers. This early stage of branching is associated with apex broadening, and later stages coincide with a switch in apex shape and specific cell division patterns (Gola 2014). Histological observations in various Selaginella species (spikemosses) have suggested that shoot meristems have a single apical cell and that dichotomy occurs in a two-step process. First, the apical cell ceases its mitotic activity and loses its meristematic features, and second, two new initials are simultaneously initiated next to the former apical cell. Whereas histological studies provide a static view of tissue architecture, clonal analysis allows elucidation of cell lineage relationships and monitoring of the fate of individual cells. This approach has been used in Selaginella kraussiana, in which dichotomous branching is anisotomous, and demonstrated that shoot development is underpinned by the activity of two transient apical initial cells (Harrison et al. 2007). During apex bifurcation, the number of initials increases to four or five and the direct descendants of these cells are allocated to two distinct groups of unequal size to give a minor and a major branch. Anisotomous dichotomy results in the formation of a so-called pseudo-monopodium where overtopping of major branches leads to the formation of the main shoot axis and minor branches are displaced to the side. Further observations in various species of Lycopodiales corroborate the existence of multicellular shoot meristems and support a notion of dichotomous branching whereby the entire meristem splits to generate two even or uneven branch apices (Gola 2014). Ferns comprise about 10,500 species and are sister to the seed plants. Apical dichotomy is recognized as the major branching mode in the sporophyte of ferns (Bierhorst 1977), and many fern species (e.g., Davallia, Stenochlaena, Polypodium, or Microsorum) have a pseudomonopodial habit with a major creeping shoot axis – called a rhizome – serving to forage the substrate for nutritive resources. Branching rhythm is usually regular in a given species and may be described in terms of the number of dichotomies per leaf initiated, although branching and leaf initiation are not directly related in development. Genera like Dipteris may branch once every five to eight leaves produced, while others like Schizaea or Actinostachys may branch two to four times more than the number of leaves formed. Extensive imaging of the surface of fixed apices from dichotomizing shoots from more than 50 fern species has revealed peculiar cellular configurations, suggesting that a single shoot apical cell may directly undergo dichotomy to generate two similar shoot apical cells (Bierhorst 1977) (Fig. 3c). Histological studies of Dennstaedtia and Hypolepis shoot apices have led to a different conclusion. In these species, the shoot apical cell may disappear and be replaced by a group of non-meristematic cells; branching would subsequently occur by de novo specification of two apical cells at its flanks (Fig. 3d). Lateral branching is common in the gametophyte of leafy liverworts, and eleven types of branching have been identified and assigned to two main classes defined by the presence or absence of a basal sheath (Stotler 1972). In sheathless branching types, the branch apical cell is formed by three oblique divisions of the branch initial cell, whereas in sheathed branching types the branch initial undergoes random divisions to form a multicellular branch primordium from which the apical cell develops. Within each class, branching types can be further distinguished by the following features: (1) the cellular origin of branch initials (in merophytes (group of cells produced from the same initial cell) near the stem apex, in cortical cells from older merophytes or from the medulla), (2) the position of merophytes from which branches initiate (ventral or dorsal), (3) the type of leaves that branches are associated with (half-leaves or unmodified lateral leaves), (4) the distance separating the leaf and the point of branch origin, and (5) the ability to displace the branch to the axil of the next oldest leaf (Fig. 3e–f) (Stotler 1972). Mosses form the largest group among bryophytes and comprise c. 13,000 species. Their exclusively lateral gametophytic branching mode underpinned their architectural diversification (Coudert et al. 2017). The shoot apical meristem in mosses comprises a single apical cell that cleaves regularly, producing segments and regenerating itself. In most moss species, each segment divides several times consecutively and generates a leaf and a branch initial cell. The order of cell division interpreted from histological sections differs between authors, but the branch initial cell is always described in a basal position with regards to the associated leaf (Fig. 3g). As growth proceeds, high cell division rates between the leaf and the branch initial cell displace the branch meristem into the axil of the leaf located underneath. Branches appear in axillary positions but are truly “hetero-axillary” as they originate from cellular territories that are distinct from the subtending leaf (Berthier 1973). After it is formed, a branch apical cell may immediately grow out into a branch (immediate branching), produce a few leaves and turn into a dormant bud, or directly enter dormancy without developing further (delayed branching). Release from dormancy may be triggered in response to various internal and external cues (see Section “Are Regulatory Mechanisms of Branching Shared Between Land Plants?”). In the moss Physcomitrella patens, dormant branch apical cells have not been observed, and branch initiation and outgrowth are a single continuous process occurring at a distance from the shoot apical meristem (Coudert et al. 2015). In other species like Sphagnum quinquefarium, Polytrichum formosum or Dendroligotrichum dendroides, most leaf axils do not have a branch apical cell and the proportion of empty axils may vary depending on environmental conditions. Apical dichotomy is a major branching mode in the sporophyte of ferns, but lateral branching is also frequent and has been well studied in the Hymenophyllaceae family (filmy ferns). Histological descriptions in Trichomanes and Hymenophyllum species showed that merophytes cut from the single shoot apical cell divide periclinally (parallel to the tissue surface) and produce an inner procambium cell and an outer prismatic cell. The latter undergoes a second periclinal division, which gives rise to adjacent frond (fern leaf) and lateral bud initials. Both initial cells then divide anticlinally (perpendicular to the tissue surface) several times to produce the frond and bud apical cells, respectively. The bud apical cell cuts off a few merophytes and ceases growth to enter dormancy, whereas the development of the frond continues. Similar observations have been made in other fern species (Bierhorst 1977), which suggests that early patterns of cell division are generally conserved within the fern lineage. However, the orientation of lateral buds with regards to the position of fronds shows a high degree of variation between species (Hébant-Mauri 1984), suggesting that subsequent cell division and growth patterns are poorly conserved (Hébant-Mauri 1993). In Trichomanes species, buds may form in an axillary position with respect to the nearest frond or at a distance from the frond axil. In Histiopteris and Hypolepis, buds are extra-axillary and form laterally at the frond base. In Adiantum, buds develop on the abaxial side of the frond, i.e., on the lower surface of the leaf. In Stromatopteris, branching occurs in bare portions of the stem, with no apparent connection to fronds. Epiphyllous branching, in which new shoots develop on the frond in non-axillary positions, represents an extreme case of lateral branching and may serve as a means for the clonal propagation of plantlets identical to the mother plant. Interspecific variation in relative bud-to-frond position might reflect differences in shoot symmetry, phyllotaxis, and growth habit (Hébant-Mauri 1993). Importantly, lateral and terminal branching are often combined in ferns. For example, Onoclea sensibilis spreads by means of dichotomizing creeping rhizomes on which fronds develop, and small lateral buds may be observed in association with the fronds in specific positions. Cycads (c. 310 species), Ginkgo biloba (1 species), gnetophytes (c. 90 species), and conifers (c. 615 species) form the gymnosperms. Together with the angiosperms (c. 300,000 species), the gymnosperms represent the seed plants (Christenhusz and Byng 2016). Lateral branching is a conserved feature of seed plants but cycads that lack lateral buds and have an unbranched growth habit (Fig. 1). Several theories, including the apical cell, histogen, and tunica/corpus theories, have provided comprehensive frameworks for describing the organization of multicellular shoot apical meristems and the cellular origins of lateral meristems in angiosperms. In the tunica-corpus concept, the “tunica” corresponds to the more superficial layers that divide only anticlinally, and the “corpus” is formed by the remaining layers located underneath in which cell division patterns are more variable. This theory has been extended to all seed plants, although it may not be widely applicable and the cellular architecture of gymnosperm shoot apices may be better captured in terms of cytohistological zones. Two main zones are typically described in gymnosperms: the apical initial group, a layer of slow dividing initial cells at the meristem surface from which all other cells are derived, and the central mother cell zone, a group of cells produced by periclinal divisions of the apical initials. By comparison, five cytohistological zones have been identified in angiosperm shoot apices, suggesting increased meristem complexity in this group. In both angiosperms and gymnosperms, lateral meristems form on the adaxial (upper) side of the leaf in a zone called the leaf axil, and lateral meristems are therefore referred to as axillary. Genetic evidence supports the relationship between the axillary meristem and the adaxial side of the leaf. For instance, in the angiosperm Arabidopsis thaliana, the PHABULOSA gene (PHB, Homeodomain-Leucine Zipper Class III transcription factor family) is required for the specification of abaxial (lower side) leaf fate. In mutant plants lacking PHB activity, the abaxial side of leaves acquires adaxial fate, resulting in the ectopic development of meristems all round the leaves. There are two main hypotheses regarding the ontogenetic origin of axillary meristems in seed plants. The “detached meristem” hypothesis proposes that lateral meristems derive directly from a persistent population of shoot apical meristem cells associated with the leaf primordium during its initiation. The alternative view proposes that there is no continuum with the shoot apical meristem and lateral meristems initiate “de novo” from differentiated tissues. While both hypotheses are supported by the expression patterns of molecular markers associated with meristematic activity such as the SHOOT MERISTEMLESS gene (STM, Homeodomain transcription factor family) (Long and Barton 2000), clonal analyses based on time-lapse imaging of tomato and Arabidopsis apices have evidenced that axillary meristems are specified early within the shoot apical meristem (Burian et al. 2016) (Fig. 3h). Most cell divisions occur between the center and lower boundary of the apical meristem, and mitotic activity is almost null when the axillary meristem leaves the apex. In the Arabidopsis shoot apical meristem, the tunica is formed by the epidermal L1 and subepidermal L2 cell layers, and the corpus is formed by the L3 cell layer and subtending tissues. Clonal analyses performed using cell autonomous genetic markers have suggested that axillary meristems are derived from tunica cells, including a minimum of two L2 cells located in a central position of the “axillant” leaf, but cells from the L3 do not contribute to lateral meristem formation. However, these observations do not hold true for all angiosperms. Histological analyses in the grass Elymus repens have shown that axillary meristems initiate by periclinal divisions in corpus derivatives. These data suggest that distinct patterns of cell divisions underpin lateral meristem formation among angiosperms. In conifers, leaves show limited degrees of lateral flattening and lateral meristems develop in their axils. Most species are assumed to develop few lateral buds and have empty leaf axils (Fink 1984), but detailed histological observations in Taxus baccata and other species have revealed that most leaf axils contain a dormant meristem (Fig. 3i). As the shoot expands and its tissues differentiate, the superficial cell layers in the axils of developing leaves remain undifferentiated and do not display any obvious global organization. After several rounds of division, the outer cell layers become suberized and form a rigid protection for underlying meristematic cells. These axillary meristems may stay dormant for several years, and following the release from dormancy bud outgrowth may be very slow and occur over years. Together, these observations suggest that the patterns of cell division during axillary meristem formation differ between angiosperms and gymnosperms, and lateral meristem organization is anatomically simpler in gymnosperms than angiosperms. Are Regulatory Mechanisms of Branching Shared Between Land Plants? As reported in the previous sections, terminal and lateral branching mechanisms evolved multiple times in the sporophyte and gametophyte generations of land plants and may be orchestrated in several manners at a cellular level, leading to similar morphologies by convergence. This raises important questions about underlying regulatory mechanisms, and in particular whether similar or distinct molecular pathways control the development of convergent branching forms. Branching is a major determinant of yield in plants of agronomic importance, and its genetic control has mainly been studied in flowering plants (Domagalska and Leyser 2011; Schmitz and Theres 2005). Forward genetic studies have identified hypo- and hyper-branching mutant plants impaired at various stages of the lateral branching process, revealing the key role of transcription factors in the establishment of leaf axil identity, the maintenance of competence for meristem formation in leaf axils, the patterning of lateral meristems, and the formation and outgrowth of lateral buds (Kebrom et al. 2012; Schmitz and Theres 2005). Corresponding gene families have also been found in the genome of bryophytes, such as the moss Physcomitrella patens, and non-flowering vascular plants, such as the lycophyte Selaginella moellendorffii, but functional studies are still limited to bryophytes and only one gene encoding a transcription factor has a reported function in branching control in these plants to date. TEOSINTE BRANCHED1 gene (TB1, class II TCP domain transcription factor family) represses lateral branching in maize and homologues in other flowering plants (e.g., BRANCHED1, BRC1) have conserved functions in the sporophyte. TCP genes predate the origin of land plants and suppressing TCP5 function in the moss Physcomitrella patens promotes sporophytic branching, although bryophyte sporophytes are normally unbranched. Phytohormones provide another level of control for branch development. In seed plants, the growth of lateral buds is usually inhibited at a distance by the main shoot apex, a phenomenon called “apical dominance.” Seminal experiments in Vicia faba have shown that the removal of a dominant apex (decapitation) is sufficient to allow lateral meristems to grow out (Thimann and Skoog 1933), and investigations in Pisum sativum have proven that the inhibitory effect is mainly due to developing leaves at the shoot apical meristem. Auxin is a phytohormone with pleiotropic effects on plant development and is mainly synthesized in young leaves in the shoot. The exogenous application of auxin to the stump of decapitated plants inhibits lateral bud outgrowth, which suggests that auxin mediates apical dominance (Cline 1996). This effect seems to be broadly conserved in herbaceous angiosperms, although weaker inhibition has been observed in some species (Cline 1996). Similar auxin replacement experiments performed in temperate woody species, such as the flowering plants Quercus, Fraxinus and Acer and the conifer Araucaria, have shown that apical dominance is conserved in shoot systems with distinct phenologies. The role of auxin in apical dominance is not direct and is relayed by two other phytohormone classes with antagonistic functions, cytokinins, and strigolactones (Domagalska and Leyser 2011). The direct application of cytokinins to buds and the endogenous increase of cytokinin levels in transgenic lines promote bud outgrowth, and auxin downregulates cytokinin biosynthesis in the stem. Conversely, the direct application of strigolactone analogues to buds inhibits their development, and the disruption of strigolactone biosynthesis and signaling pathways in mutants promotes axillary branching. Such mutants are resistant to the inhibitory effects of apical auxin, and auxin signaling genes activate strigolactone biosynthesis. Buds are also auxin sources, and the outgrowth of buds depends on their capacity to export auxin toward the stem. Auxin movement is mediated by the polar auxin transport protein PIN1 (PIN-FORMED1, PIN auxin efflux carrier family), and strigolactones regulate competition between lateral buds by reducing the accumulation of PIN1 proteins at the plasma membrane and dampening auxin transport capacity in the stem. Auxin, cytokinin, and strigolactone thus form a systemic regulatory network that is coordinated globally, via the PIN1-dependent polar auxin transport stream, and integrated locally by specific factors, such as the BRC1 gene whose expression is activated by strigolactones and repressed by cytokinins in buds (Domagalska and Leyser 2011). The extent to which these hormonal regulatory pathways are conserved across land plants is largely unknown. Decapitation experiments performed in bryophytes (Coudert et al. 2015), lycophytes, and ferns have shown that apical dominance is conserved in all plant lineages and could provide a universal mechanism for branching control at a distance from a dominant apex. Although auxin can replace the function of apices that have been artificially removed in the liverwort, moss, and lycophyte species that have been tested, it is unable to do so in some ferns, suggesting variation in molecular mechanisms between lineages. A recent study in pea demonstrated that sugar demand, rather than auxin, is the initial regulator of apical dominance, and resource-based mechanisms might explain the lack of visible effect in auxin replacement experiments in some non-flowering plants. Genetic evidence supports an inhibitory role for auxin and strigolactones, and a promoting role for cytokinins, in gametophytic shoot branching in the moss Physcomitrella patens, which suggests the function of phytohormones was co-opted from the gametophyte to the sporophyte generation during land plant evolution. Although PIN genes are conserved in mosses and regulate shoot development in Physcomitrella, the disruption of PIN function or polar auxin transport promotes branching in the sporophyte, but has weak effects in the gametophyte (Bennett et al. 2014; Coudert et al. 2015). These data suggest that PIN-mediated polar auxin transport is conserved in the sporophyte generation of land plants, but other mechanisms are involved in the gametophyte (Harrison 2016). An alternative diffusive auxin transport mechanism, regulated by callose-dependent plasmodesmal gating, could instead regulate branching in the moss gametophyte (Coudert et al. 2015). This mechanism might be shared with liverworts and hornworts that display non-polar or weakly polar auxin transport in both generations. Although our knowledge is strongly biased towards flowering plant species, the data presented here suggest that molecular pathways regulating branching are at least partially similar between major plant groups and across life cycle stages. These molecular interaction networks could have been inherited from land plant ancestors and re-used repeatedly in evolution to regulate branching, irrespective of the cellular processes underlying branch formation. Recent progress in functional genomics has enabled the establishment of new model hornwort, liverwort, moss, and fern species, and the role of key genes identified in flowering plant models may now be investigated in more basal lineages through reverse genetics. Forward genetic screens in early diverging land plant models will also be important in discovering nonconserved regulators of branching. Combining these approaches will allow us to determine the extent of deep homology (Shubin et al. 2009) in the development of branching forms in land plants. I am grateful to Jill Harrison, Florian Jabbour and Jeremy Solly for helpful suggestions and proofreading the manuscript. I thank the CNRS (ATIP-Avenir programme) and the Natural History Museum Paris (ATM programme) for funding research in my laboratory.